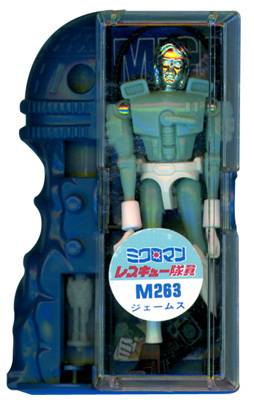 This is James (M263) from the Microman Rescue Command series released in 1979 by Takara. James and his buddies came in these great capsules. Note the small figure to the left of James. It is a molded, glow-in-the-dark figure inside of a plastic tube. By pressing and releasing a lever in front, you can propel the figure up the tube! James and the rest of the Rescue Command figures come with a backpack and gun. The gun, which attaches to the backpack via a cord similar to Membros' Hydratubing, can be held or mounted to the side of the figure's leg. James' actual color is a nice, medium level green and white.